Kevin Seah is a fashion designer who has made a name for himself creating couture and bridal gowns. Last year he extended his services to a men’s readymade and bespoke line. Recently he also landed regional distributorship for Alfred Sargent shoes and a wide range of fantastic quality European fabrics. Cheryl Ow Hui is a make up artist for bridal, film, commercials and special effects, in addition to training professional classes and workshops at Make Up Forever. Kevin custom made both of their outfits and Cheryl was in charge of her own makeup and hair. 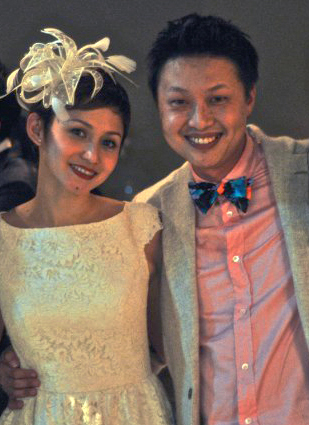 This DIY couple is arguably Singapore’s most stylish duo! And it comes as no surprise that their engagement and wedding rings are something out of the ordinary. We wanted to know more. Diamond solitaires are the most popular rings for engagements. 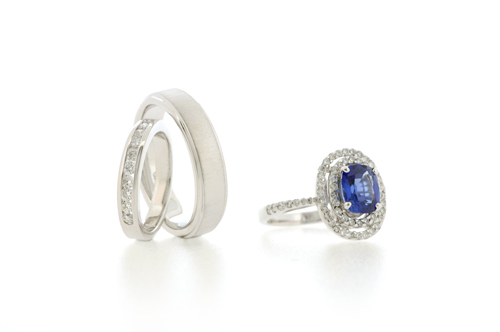 What made you choose a Blue Sapphire for yours? Cheryl: The Blue Sapphire has an air of mystery to it and I have always been fascinated with it. My first pair of earrings were given to me by my mother. It was a flower design with a tiny little sapphire in it and it was the prettiest thing in the whole world to me at that point. I suppose that’s another reason why I love the Blue Sapphire, it brings back lovely memories for me. Your wedding outfits follow a vintage theme and so did your engagement ring. Please share your thoughts. CheryI: I find vintage objects have more character, and soul. Even women back then had so much more style and they took great pride in doing their hair and make up. Nowadays it’s a wet mop of hair running into the MRT. I wanted my engagement ring to represent me and the things I like. When people look at my ring I want them to say ‘Wow Cheryl, its so you” and not ‘wah so big hor how much did he pay for it?’ It’s your engagement ring for crying out loud!! Kevin, having many years experience of designing wedding gowns, you must have seen quite a few options for rings as well. What were you looking for in your own wedding rings? Kevin: I wanted something simple, timeless and unique, hence the brushed finish.